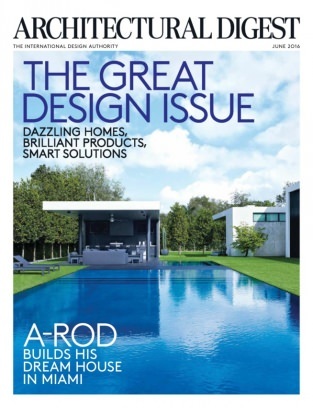 Big thank you to Architectural Digest for sharing my thoughts on adding a POP of color to interiors! You can read the article below or check it out online HERE. Traditional decor tends to conjure up a restrained palette rather than an electric one, but there’s no reason a classic interior can’t handle a shot of color. 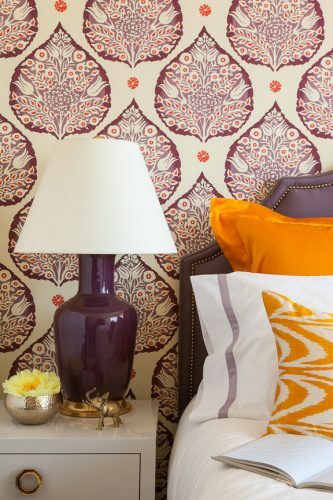 In fact, a bold hue can make elegant, timeless elements stand out all the more. “My overarching philosophy is that traditional design provides the ideal backdrop for layering in color,” says San Francisco–based designer Grant K. Gibson, a master of adding a vibrant pop to spaces. “I like to say—only somewhat facetiously—that I am taking your grandmother’s home and making it livable for today.” Here, Gibson gives us his expert advice. A breakfast nook is an opportunity to have more fun with color and pattern. For this family home, Gibson worked with Quadrille to have a toile textile custom colored, then took the blue from the toile to create a complementary zigzag fabric for the chair cushions. “This client is clearly not afraid of color,” says Gibson. 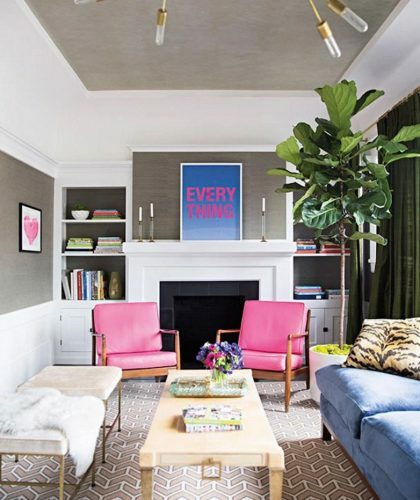 “Pink was our accent color of choice, as seen in the vintage Danish modern chairs, which belonged to the client’s grandmother.” By layering the walls with a Phillip Jeffries gray grass cloth, he both grounded the room and let the magenta hue shine. 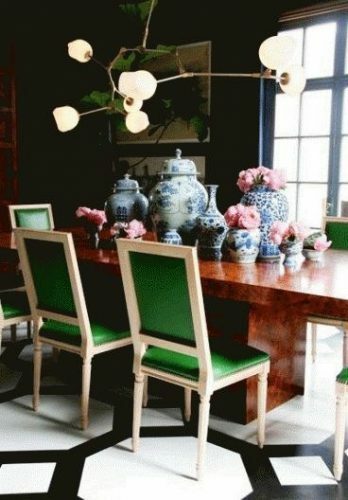 In kelly green, a Louis XVI chair takes on an entirely new identity. “The color achieves a sense of modernity in a classic style,” says Gibson. “Upon seeing this Galbraith & Paul wallpaper, we fell in love with the shapes and colors, which clearly dictated our choices for the rest of the design,” says Gibson. He chose an aubergine Christopher Spitzmiller lamp, saffron-color bedding from Matouk, and an ikat pillow from Sue Fisher King. 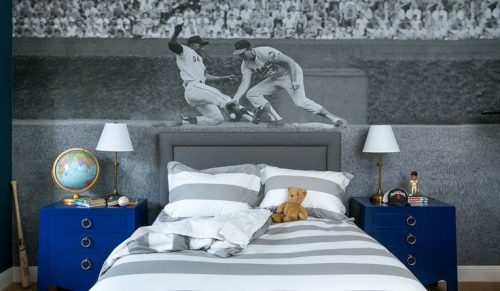 For this young baseball fan’s room, Gibson blew up a photograph of Willie Mays to create one-of-a-kind wallpaper. But it was a strategic move, too. The grays and whites of the photo create a neutral backdrop that shows off the royal blue bedside tables from Bungalow 5. Congratulations on this very impresive achievement. The advice and editorial photos are great! Thank you for the inspiration. Love following your blog.